There are 22 acres of Truffula Trees, so to speak, just outside the city limits of Boulder, adjacent to the East Boulder Recreation Center. The area, known as the Hogan-Pancost property, is home to wetlands, wildlife and lots of water. It’s in the South Boulder Creek Flood Plain – “high hazard” for flooding. And, since the recent building of soccer fields and parking lots near the rec center, those of us whose homes line the west boundary of Hogan-Pancost now have sump pumps in our basements. In peak wet season, our pumps remove tens of thousands of gallons of water from our homes’ lower levels each day – water that didn’t enter our homes before the land was disturbed for building. The land is part of the Boulder Valley Comprehensive Plan, and can be annexed into city limits. It’s the last large parcel of land in Area II that can be developed. 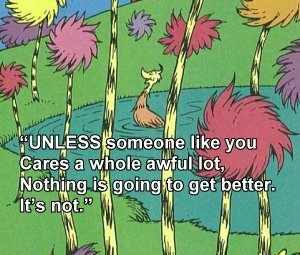 But we say just because it can, doesn’t mean it should. Developer Mike Boyers, whose plans for developing Hogan-Pancost have been turned down several times in the past, is trying again. The concept plan for his Boulder Creek Commons development will be discussed at the City of Boulder Planning Board meeting tentatively set for Jan. 19, 2012. The overall effect of urban growth must add significant value to the community, improving quality of life. The city will require development and redevelopment as a whole to provide significant community benefits and to maintain or improve environmental quality as a precondition for further housing and community growth. Does the Boulder Creek Commons concept plan uphold these values? NO. Compromised Child Safety: The safety of Manhattan Middle School students as they face substantially increased traffic at already-congested peak drive times. In addition, children playing at Keewaydin Park, adjacent to the middle school, will face increased traffic in an area already heavily-used for after-school sports events. Parked cars line Manhattan Drive for blocks during such events, making it difficult to see small children as they attempt to cross the street. Compounded Residential Traffic Congestion: The impact on Kewanee Drive – a short, dead-end street with a dozen or so homes with driveways connecting to the street – would be devastating. Even the developer’s conservative estimates of six to ten car trips per household per day add up, when you consider a minimum of 120 new “units” at the end of the street. 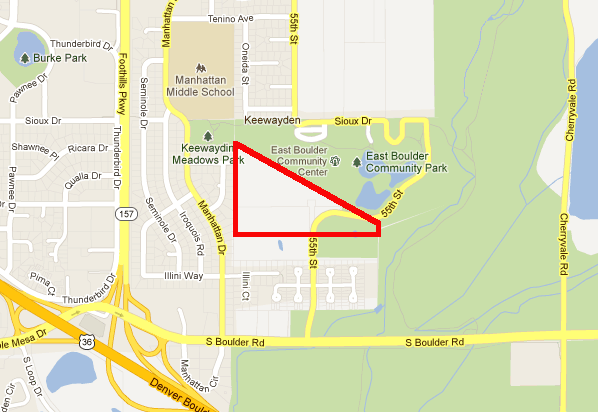 The other access street, 55th, is what neighbors call a “slow road to nowhere.” It jogs around the East Boulder Rec. Center and borders open space, not any shops or services. It’s reasonable to assume that most traffic in and out of Boulder Creek Commons would use Kewanee Drive, severely impacting residents. Wetlands Destruction: The proposed destruction of wetlands, even with a developer promise to re-create them somewhere else on the Hogan-Pancost land, is suspect. Why destroy what nature intended? Isn’t protecting fragile habitats a core value of Boulder city officials and residents? Increased Flooding: The western and eastern portions of the Hogan-Pancost property are in the designated 100-year flood plain, with some areas deemed “high hazard,” according to a city study. According to the City of Boulder’s web site, Boulder is the #1 flash flood risk in the entire state. The site says: “It only takes three inches of rain over a few hours to trigger a 100-year flood.” Those of us who lived through the 1969 flood in this area saw the land behind our homes become a fast-moving river. That same land would become Boulder Creek Commons. Groundwater Drainage Issues: Groundwater is a huge concern among those of us who live on the western border of Hogan-Pancost. (Remember our sump pumps?) Many of us had no water in our basements prior to the nearby soccer fields and parking lots being built. We are extremely concerned that increased development will only make the situation worse. Broken Promises: A memo from city staff in 1992, discussing the possibility of making Kewanee Drive a through-street, connecting to future development, promised us it would never happen. Here’s a direct quote from that memo: “…staff and Planning Board made assurances to the neighborhood on Manhattan Dr. that this connection would not be made in the future.” Area residents trusted city leaders then, and hope they can still trust them now. Take the city survey about the proposed Boulder Creek Commons concept plan. Speak out at the Planning Board meeting, tentatively set for Jan. 19, 2012, at 6:00 p.m., in City Council chambers, 1777 Broadway, second floor. Join the Southeast Boulder Neighborhoods Association (SEBNA) www.seboulder.org. one of the highest densities of Preble’s found on Open Space lands was immediately east of this property. For years the developer has tried to avoid the issue of actually doing a trapping survey to see if there are Preble’s. They even went to the US Fish and Wildlife Service many years ago to gain an exemption to any trapping survey on the property. This 3rd party review doesn’t sound like much of a review.